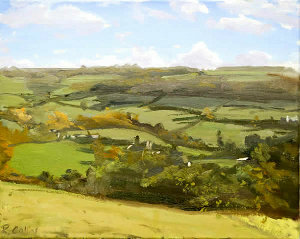 Rob Collins is making 50 paintings of exactly the same view from the hills above his home in Gloucestershire over the course of the next year in order to record the changing seasons, light and weather. Making one painting a week at different times of the day, each painting takes about an hour and a half to complete. Rob has already done fourteen and experienced bitter cold wind, mist, rain and beautiful sunshine. Eventually he will exhibit them together but if you are interested to see progress so far, click here to visit his website where you can view the images and a few sentences about working conditions for each one. There is already a sense of the changing year with the rising sun having moved perceptibly along the horizon and primroses in flower on Boxing Day despite hard frosts. If you have friends or contacts you think may be interested please send on the link to the web page.